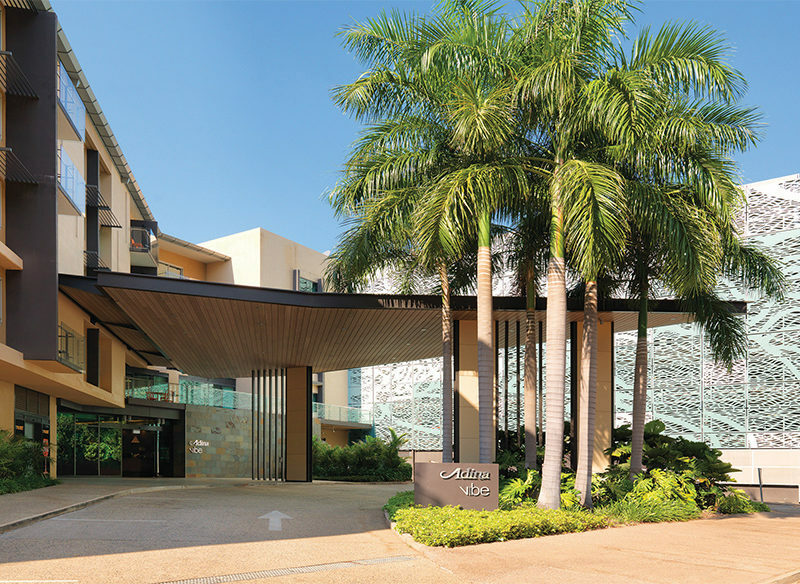 Adina Apartment Hotel Darwin Waterfront: this ambitious development has something to offer both local residents and visiting fans of the Adina brands, writes Quentin Long. There is something reassuring about staying in a precinct of a city where its own citizens come to play. You subconsciously feel that you have chosen your digs well because, hell, if the residents like to come here, then you ain’t a tourist but a traveller who is getting into the true heart of the place. The mammoth Darwin Waterfront development is a $1 billion, 15-year project that’s epic in any developer’s book, let alone in ‘little ole Darwin’. The fantastic result is where the northern capital’s residents come for fun. The huge wave pool at the Darwin Waterfront is the locals’ place to cool off without fear of being a meal for Darwin Harbour’s saltwater crocodiles. 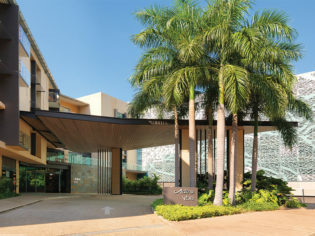 And it’s here that my personal first choice of Darwin digs is located – the Adina Apartment Hotel Darwin Waterfront. The development as a whole was born from a collaboration between the Toga Hospitality Group – owner of the Medina/Adina and Vibe accommodation brands – and the NT government. The first stage opened in 2009 with the convention centre, Adina serviced apartments, Vibe Hotel and 138 residential apartments. I have always been a fan of the Adina brand, so settling into the Darwin hotel was just another rendezvous with an old friend. Adina serviced apartments are usually well appointed, spacious and fantastic value for what you get. Overall, they achieve the universal goal of any hotelier: making guests feel at home in a place as good as, if not better than their own, and at a price that makes them feel smug. Lounging on one of the sizable and relatively new sofas in front of the also sizable and new flatscreen TV is just the start of that feeling for me. My bag springs open like a jack-in-the-box and my gear is dispersed willy-nilly, but the apartment’s size means it doesn’t look like a pigsty. It’s guilt-free slothing – that’s better than home. I can also use the decent kitchenette for home-cooked meals when I tire of eating out. Something that particularly appeals to me about the Adina Apartment Hotel Darwin Waterfront is the collection of Aboriginal artworks that the Toga Group has purposefully collected and placed in the public spaces of the hotel complex. They’re stunning and stylish, as I’d expect from the brand. Then there is the bonus of the Waterfront precinct itself. Retail shopping has been slow to arrive and this is a little disappointing, but it’s no reason to avoid the place. A number of relaxed restaurants make it easy living for a couple of days – it just could be so much better. The wave pool is a great concept, but for a southerner who likes space in his living quarters and swimming experiences alike, it is more interesting to watch than actually dive into. The wave pool is so popular with locals that it would require sharper elbows than mine to swim without bouncing off half the under-16s in Darwin. Thankfully the Adina and Vibe Hotel share a small, quiet pool of their own where sharp elbows are not required. Not all Adinas are created equal: while most are very good, some let the brand down from time to time. But I’m happy to say that Adina Apartment Hotel Darwin Waterfront joins my top four (the other three being the Medina St Kilda, Medina Grand Harbourside Sydney and the Medina Treasury Adelaide). Quentin Long who paid his own way and visited anonymously says: It’s the perfect combination of space and service to make me feel right at home. It’s my first choice of places to stay in Darwin. Darwin’s markets are some of the best in the country; we rate highly Mindil Beach Thursday evening markets and Saturday’s Parap markets. In the Dry, nothing beats a picture-perfect sunset with a bottle of wine and fantastic stall food at Mindil Beach. It’s the natural base for exploring two fantastic national parks: Kakadu and Litchfield. A day trip to either is OK, but try to make it for at least a night. Darwin is the most vibrant Indigenous city and gives you tremendous access to art touring. From a simple day trip to the Tiwi Islands to a more extensive Arnhem Land tour, it’s always worth it. Darwin is significant in our nation’s history and it’s full of great museums and historical sights. The Museum and Art Gallery of the NT is a fabulous place with permanent exhibitions about the Darwin bombings, Cyclone Tracey, pioneers and explorers. Apart from the national parks, Darwin is an outdoorsy person’s paradise with fantastic sailing, fishing, walks and cycling.